We have had some truly exceptional performances this week in a wide range of sports. I have seen so much depth in our sport in my first two terms here – we give every pupil the opportunity to discover a sport that they really enjoy and help them to develop their skills. Almost every week we have been able to select every Fourth Form pupil to represent the school at hockey, netball or rugby and every Saturday more than half the school plays in a competitive fixture. We also help those pupils who want to develop into excellent performers, competing at county, regional and national level. There are many of our pupils and teams who have achieved high level success throughout the year – this week’s report highlights the achievements of our pupils and teams in just the last ten days! It was a great pleasure to watch our swimming team in their last gala of the season against Oundle School on Thursday. Lead by the inspiring Adrian Ting, they have won every school swimming gala they have competed in over the last two years and won a bronze medal at the Independent Schools’ Aldenham Cup last week. Throughout the season there have been 18 new personal bests and eight school records broken! We are very proud of what the swimming team has managed to achieve in the last two years. On Saturday we had our annual fixture against the Uppingham Veterans’ Rifle Club (UVRC), which include current and former international shots. For only the second time in six years we won, with a score of UVRC 966 - Uppingham School 994, and some excellent shooting from veteran Reg Curtis and our own Ross Carmichael, who both scored 99/100. The fixture was followed by a lovely dinner in the evening where I discovered that Uppingham has produced more international performers in shooting than in any other sport. Lara Mullins and Katie Riddle played superbly in this weekend’s Super County National Final, making it to the top division, playing for the cup. Their team just missed out on a place in the national final on a sudden death goal after having fought back to equalise in the second half from four goals down in their semi-final, to finish in fourth place nationally. The tournament is an opportunity for the best lacrosse players in the country to compete against each other in various teams, so to have two of our girls competing at this level is really pleasing. We received the very exciting news this week that Jack Hughes has been awarded a professional playing contract at Northampton Saints for next year. Jack has been one of the stand out performers in our 1st XV over the last two seasons and has been training really hard to achieve his goal of becoming a professional athlete. After a great run in the Independent Schools Hockey Cup our U15s lost out to Churcher’s College in the quarter final on Tuesday. Our 1st XI had a fantastic game away at Watford Grammar School on Wednesday, winning 5-0 with goals from Charlie Hurd, Archie Hogan, Archie Fowler and two for Harry Nicholls, to progress to the third round of the National Plate; they backed this up with another brilliant victory against Bromsgrove School on Saturday. Our U16 boys have also been on great form, defeating Bedford School and Rugby School in recent weeks before drawing 2-2 with Bromsgrove on Saturday. 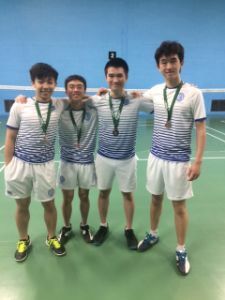 Our U18 badminton team (Captain Adrian Woo, Cyrus Wong, Jason Chiu and Tim Tian) finished third in the Leicestershire County Badminton U18 finals; having lost to Ashby School in the semi-finals, we defeated Leicester Grammar School in the third/fourth team play-off. Bertie Tweed, Freya Radford and Fenella Blayney competed for Leicestershire and Rutland at the English Schools’ Cross Country Championships on Saturday. In their absence our cross country team put in a massive performance with Amelie Goetz, Jolyon Leavesley and Nick Cardozo taking individual wins as our teams had a clean sweep of victories. I really enjoyed watching our girls 1st XI play Stamford High School on Saturday. In windy conditions our girls played really well scoring four great goals – it was terrific to see so many parents supporting the team as well. Our U16 boys had their best performance of the season against Brooke House Academy - they worked so hard for the whole match and were deserved 3-1 winners. Our 1st VII has made tremendous progress this year and claimed another two victories, against Oundle School and Bedford Modern School, on Saturday. Earlier this season we lost a close game to Oundle but managed to win convincingly on Saturday, in spite of the very difficult playing conditions. After results did not go their way in the 15-a-side season, our U16s have been on magnificent form in Sevens this term. On Sunday they represented the School at the Wisbech Tournament, winning their pool for the second week running before defeating Oundle School 33-14 to progress to the Cup Final against Ipswich School, where they lost out in a pulsating encounter by just three points (21-24). Henry Hunt, Samuel Burchnall, William Meadows and Barney Plant were all standout performers and confidence will be high moving into Rosslyn Park Sevens next week. Our 1st VII had a great day out at Mount St Mary’s on Sunday. Playing their best Sevens of the season they were narrowly beaten by Hymers College and eventual finalists St Peter’s, York, before thrashing Barnard Castle and winning in the last play of the game against Ampleforth College. With some tired legs, the plate semi-final was a game too far, with impressive Bradford Grammar School putting us to the sword. There were stand out performances from Felix Badcock, Hugo Berney (including a 95m try) and Charles Wood. Jack Hughes was offloading like the England team in the first half and Henry Langford ran in tries like Scotland in the second! Well done to Ben Larrett as well for stepping up to the seniors.